Product #21437 | SKU 9305 | 0.0 (no ratings yet) Thanks for your rating! 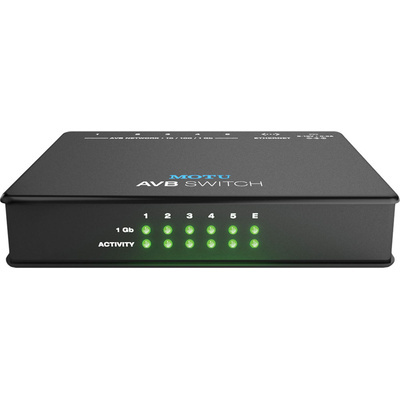 The MOTU AVB Switch - Five-Port AVB Ethernet Switch is designed to connect up to five AVB Audio, Video, or Switch interfaces into a network using the IEEE 802.1 AVB standard and CAT-5e or CAT-6 Ethernet cables up to 100 meters in length. This networking standard provides real-time, low-latency, fully synchronized streaming of audio and video over Ethernet. The back panel of the switch features five 1-Gigabit AVB Ethernet ports as well as one standard Ethernet port for connecting the device to the Internet or a Wi-Fi router. The five AVB ports can also be used for standard Ethernet. Two front panel rows of LEDs provide visual feedback of the network connections and status of each port. For convenience and reliability, the system features automatic device discovery so no IT experience is required and implements AVB's Stream Reservation protocol to provide guaranteed Quality of Service and ensure uninterrupted connections. The system also provides a network-wide time bass for synchronizing all connected devices within one sample phase lock and with timing accuracy within the nanosecond.